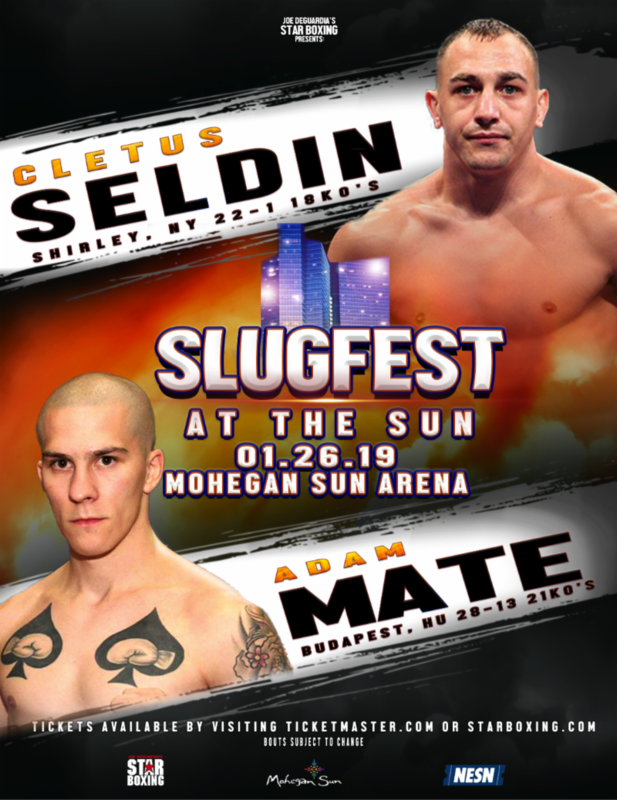 Star Boxing’s “SLUGFEST at the SUN” featuring feared knockout artist, CLETUS “THE HEBREW HAMMER” SELDIN and Hungarian banger, ADAM MATE, is set to cause fireworks at Mohegan Sun Arena, tomorrow night (1/26). Star Boxing is pleased to announce that if you are unable to make it the stellar night of fights, we have you covered. Watch SLUGFEST at the SUN live on PPV through FITE.TV. FITE, the world leader in the digital distribution of combat sports will stream the event live on the www.FITE.TV website, FITE mobile apps for iOS, Android, and the FITE channels of Amazon Fire, Android, Apple TV, and Roku on a PPV basis. The FITE PPV will be available for just $14.99. Check availability in your area by going to the FITE.tv website. The FITE.TV PPV will be blacked out in the New England area. WATCH ENTIRE SHOW LIVE SLUGFEST AT THE SUN CLICK HERE!!! FITE is a premium digital live streaming network. With live programming from 250+ partners from over 30 countries, FITE delivers MMA, Professional Wrestling, Boxing, and Kickboxing events live to it’s million registered viewers. Since its launch in February 2016, FITE has presented over-1,500 live events and offers over-12,000 hours of video library available to watch on demand. FITE proprietary instant streaming technology allows viewers to seamlessly cast premium live events to connected screens across the world. FITE is available as a mobile app on iOS and Android mobile devices, online at www.FITE.tv and on the Roku, Apple TV, Amazon Fire and Android TV platforms. Tickets Start at just $29 (plus venue fee)! For more information visit, www.StarBoxing.com. Tickets also available at the Mohegan Sun Arena Box Office. 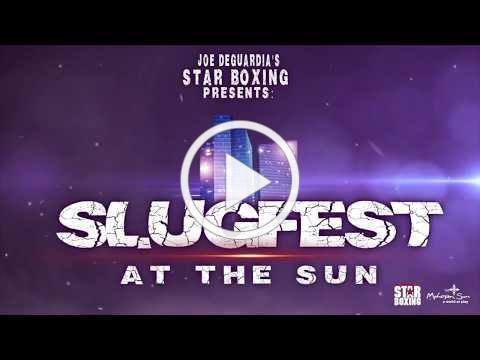 Joe DeGuardia’s Star Boxing “SLUGFEST at the SUN” series is the premier professional boxing experience in Connecticut. Live from the beautiful Mohegan Sun Arena, “SLUGFEST at the SUN” has seen some of the best and brightness in boxing. This includes, three-time world champion Demetrius “Boo Boo” Andrade, former WBC International Light Heavyweight champion Joe “The Beast” Smith, Jr., and world title challenger Delvin Rodriguez, amongst many others. Connecticut Boxing Hall of Fame inductee, Joe DeGuardia, has consistently given the boxing fans of Connecticut, world class fights, right in their own backyard. “SLUGFEST at the SUN” also gives the northeast’s rising boxing stars an avenue to world title contention. From world title fights, to world class boxing skill, Mohegan Sun has seen it all, delivered by Star Boxing. The “SLUGFEST at the SUN” series offers an affordable, fan friendly, entertaining night out, that is guaranteed to have you on your feet from the opening bell. On JANUARY 26TH, Star Boxing plans to kick your new year off right, with yet another thrilling “SLUGFEST at the SUN” experience.